Workplace changes were forcing me to learn yet another new technology and I was feeling a bit discouraged. Then I had one of those “ah ha” moments when I remembered how easily I prepared for my MCSE exams a decade earlier using mind maps. For some reason I quit using them; I realized I could apply those same learning skills again. During those days when the MCSE (Microsoft Certified System Engineer) certification was so much in vogue, I had determined to get certified through self study. I pulled it off in about a year of effort; at that time it consisted of six exams on subjects such as networking and SQL Server administration. It cost me nothing but time as my employer paid for the exams. I had a set of study books and mind mapped every chapter. I think most readers have at least some familiarity with what a mind map is. 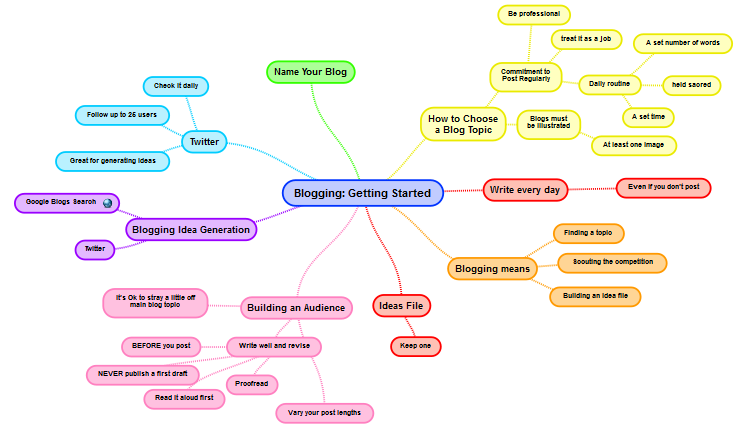 Here’s a mind map I created recently from a chapter in a book about blogging. When you use Mind Maps on a daily basis, you will find that your life becomes more productive, fulfilled, and successful on every level. There are no limits to the number of thoughts, ideas and connections that your brain can make, which means that there are no limits to the different ways you can use Mind Maps to help you. We all do it. We read half a page and then realize we haven’t absorbed a word. When your mind is actively searching for a key concept to add a node on a mind map, it engages your brain to pay attention. Most technical books are logically organized into chapters and sections. I usually make the chapter title the central node of the map and then create major sub-nodes from the section headings. If there is material that doesn’t interest me I skip it. I then scan each section for sub-sections and key points. These become third and fourth tier nodes. It’s similar to taking notes the traditional way except it’s nonlinear. You can jump around in the chapter, add auxiliary ideas, go back, rearrange nodes, insert images, icons or change colors to emphasize key ideas. Instead of pages of notes, mind maps are made up of keywords and short phrases, which are easier to remember. By linking each word to the next, you create a natural association, or hook, between concepts. Adding images and color, your notes aren’t a page of drab sameness. If preparing for an exam, I find myself able to remember the overall shape and color of a mind map, and usually the details also emerge from the recesses of my memory. In fact, as I write this, I can still visualize some of the maps I created for the MCSE exams some years ago. You can be creative while you learn. Have fun adding images that spark your memory. Adding images and color is analogous to bolding and highlighting in traditional note taking. Learning styles are generally grouped as visual, auditory, and kinesthetic (physical). When you create a mind map while you learn new material, you certainly activate your visual learning style. But you also engage your “hands-on” learning as you draw and create your mind map “picture” using paper or a computer. During that MCSE study period I used paper and colored pens to create mind maps. Now I use a program called SimpleMind™. There may be free tools, but the price is reasonable and SimpleMind™ works on all my devices: Mac, Windows, iPad, and iPhone. It uses Dropbox for network storage so I can edit or view my latest mind maps from anywhere. The example map shown was created using this tool, which I have no financial incentive to promote by-the-way. I have a pattern of learning a useful technique and then forgetting or dropping it in pursuit of the next shiny thing. This time I’m determined to remember past successes and capitalize on the proven worth of mind maps to continue getting the benefits. In this post I share a UI test framework design that’s worked well for our automation team. This framework design strives to adhere to the don’t repeat yourself (DRY) principle from the book The Pragmatic Programmer and I think this is reflected in the way we structured the solution. I created a little C# test project to demonstrate the simplicity of the design. It contains a single test method that opens a Chrome browser, navigates to the Yahoo search page, enters a search term, and asserts an expected search result. The big idea is to keep the details of each web page interaction in its own class and separate from the test logic. This allows some real advantages. The first advantage is that the page element navigation can be defined once then reused by any test. If the UI changes, which it always does, the code update is needed only in one location, the page map file. The second advantage is the test method itself can be kept clean and short. 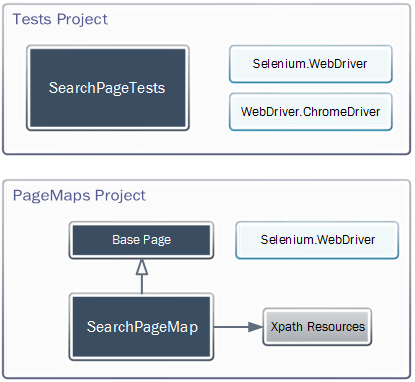 The Selenium WebDriver component can locate the page elements using several methods, by element Id, XPath, Css, and several others. I use XPath because it is reliable, doesn’t rely on visible text, and you get the rich Xpath syntax if you want to customize the XPath returned by the Chrome developer tools; yes, Chrome does the work for you. I like to store my Xpath strings in one place for easy reviewing and updates. A resources (.resx) file is a great place for this. Highlight the PageMaps project in the Solution explorer, right-click the name and select Properties. Select the Resources tab and click on the link shown to create a default resources file. To get the first element XPath for our sample which automates the Yahoo search page, open Chrome to http://search.yahoo.com, right-click the Search button, and click “Inspect Element”. This opens the Chrome Developer Tools sidebar with the <input> element highlighted. Right-click the highlighted element and click “Copy XPath”. 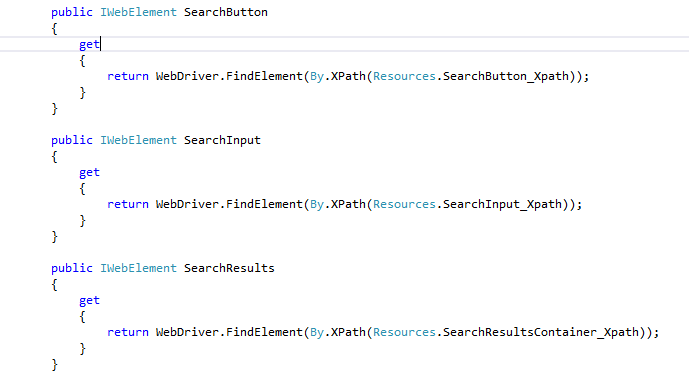 Create a string value in the resources file for each needed page element XPath expression as shown below. Now we’re ready to write some code! Add a new class file to the PageMaps project called SearchPage. We’ll add three properties to wrap the Selenium selectors, one each for the search page text input, the search button, and the search results area. Type the following code into your SearchPage class. You’ll need to add a “using OpenQA.Selenium” statement to the top of the file. We need a method in our SearchPage file that takes a search term string and validates whether the page displays expected text. If the test succeeds, a reference to our map page is returned, else an Assert exception is thrown. Now we’re ready to create our first test. In the UnitTest1.cs file, which I renamed to SearchTests.cs, change the TestMethod1 name to “BasicSearchShowsWikipediaEntry” and add the statement shown. This test may look a little strange if you’re used to the Arrange–Act–Assert style. After some back and forth discussion our team settled on this style, aka “fluent”, wherein each method returns the appropriate type of object for the next method. For more discussion of the fluent style, check out this post by Tom Fischer, Fluent Code in C#. 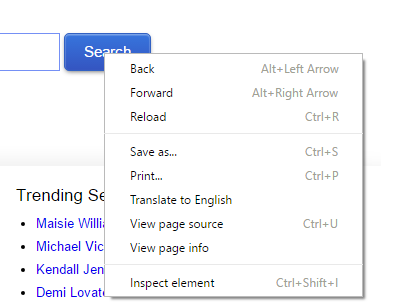 In this framework, the SubmitSearch method enters the search term, clicks the submit button, asserts the text is found on the page, and returns a reference to the search page. While the reference isn’t used in this example, a little imagination can enable you to visualize how a multi-step scenario could be done in a single statement by chaining together methods. This is a contrived example but imagine you needed to visit several pages in sequence, and each action method returned the landing page to perform the next step. All the action details and assertions are contained on the map page and the test becomes merely a sequence of steps that can be chained together or tested separately in their own test method. We’ve been using this “fluent” style of writing test automation for almost a year and it’s been very efficient. Using a resource file for element paths and having a separate page map for each page under test has also proved its worth. You could extend this example in several ways, such as creating a base map page containing common elements, such as navigation controls, which is inherited by all page maps. I hope you found these concepts useful.